Well, it's August, which means it's time for ConnCon! A Saturday of gaming in my basement, with snacks, beverages and fun for all. I start the day at 9 am and end at midnight, so the day is long, but fun. Before I recap the day, I'd like to thank everyone that attended. I had a record turnout...well over a dozen gamers that came and went throughout the day. Ken showed up first around 9:45. We piddled around and played darts for a while, waiting for Chad and Terry to arrive. 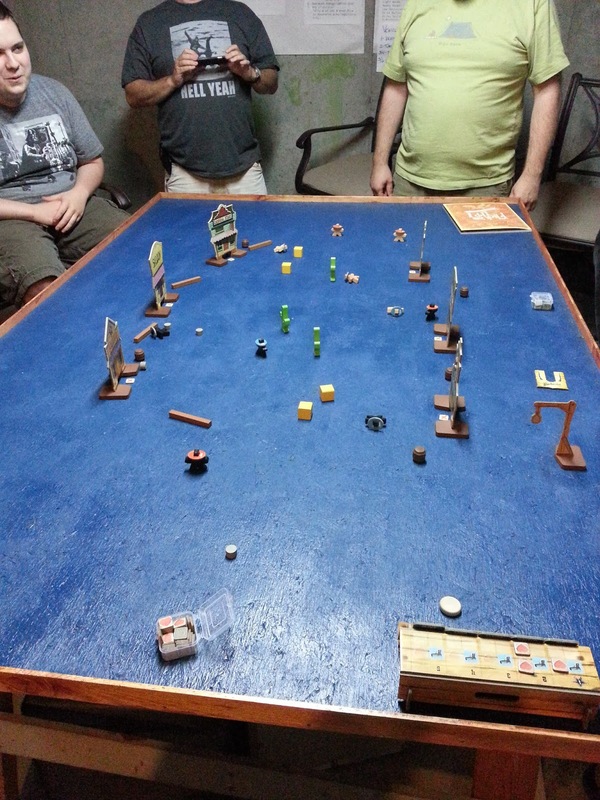 We started the day playing a couple of games of Villa Paletti, a dexterity game that needs a very steady hand. I went upstairs to prep the snacks while the guys played the second game. After noshing on jalapeno poppers, meat log pieces, crackers and cheese, we got out Sons of Anarchy. It's an interesting game and I'm glad that Ken brought it. While we were in the midst of guns, drugs and cash, a few more players arrived. 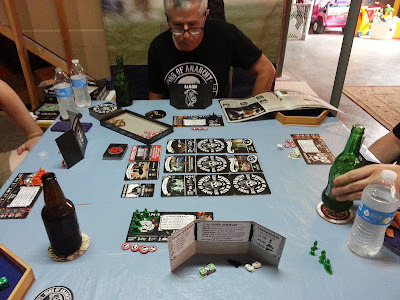 They played D-Day Dice while we finished our game. I've wanted to play D-Day Dice for quite a while now, but it wasn't meant to be this day. 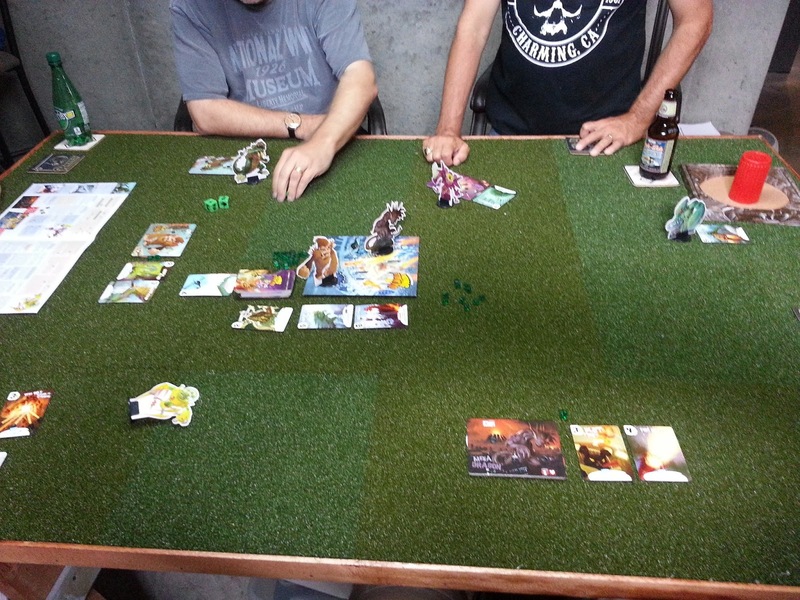 King of Tokyo was up next. Most of us had never tried this game before. Easily learned, but fun! This one may get added to my collection at some point. We had eight players ready to go, so I got out Fortune & Glory. It took a while, but was well worth the effort. While we played, even more people arrived. They played Star Realms or read rules while they waited for our game to end. After Fortune & Glory concluded, we ordered Chinese food and conversed about the games we'd played and what was next on the docket. We decided to try Flick 'em Up. Man, am I glad we did! It'll be a game I'm on the hunt for in the near future. We all busted up laughing at how well or lousy people did and how the game evolved. With eight players still available, we decided to split up into two groups. 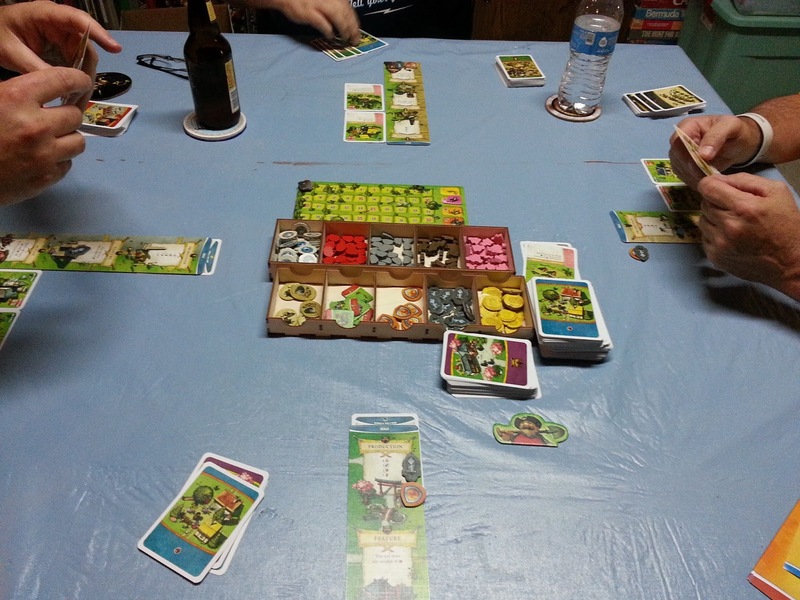 My group played Imperial Settlers, while the other group played Blood Rage. Both were great ways to end the day. We concluded around 1 am. A couple of guys hung around, so I introduced them to Exploding Kittens. We were exhausted by then and I wound up getting to sleep around 2 am. 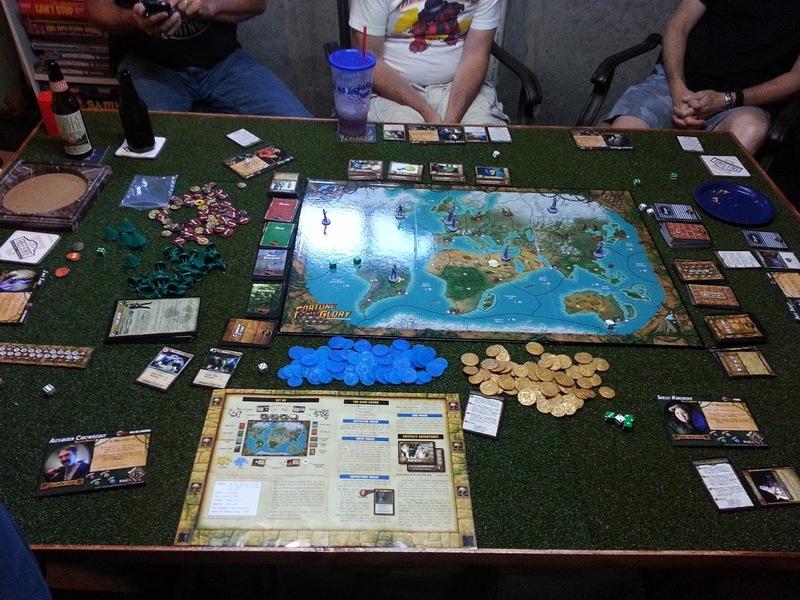 All in all, a great day of gaming with a great group of guys. There were a lot of laughs and we tried out several new-to-us games. Thanks again to everyone that attended and mark your calendars for next August!